1. Timber skirting, etc should be removed as outlined in specification. 2. Plaster in removed back to masonry to a height as outlined in the specification, but should not be less than a height of1 metre or 500mm above the maximum level of the visual rising damp/salt contaminated plaster. the water must be clean, free from oil, dirt or other injurious chemicals (water suitable for drinking if available). 1. Prepare 3 parts sand to 1 part cement using gauging water containing suitable waterproofing additive. The sand should be specified as washed sharp, concrete sand, loam-free, which satisfies the requirements for Zone 2/3 grading as laid down in British Standards 882: 1973. The cement should be fresh and free following. 2. Use minimum of water to ensure a dnse coat; an approximation is not more than 8 litres per 50 kilos of dry mix. 3. Compact mix into joints and render to give an overall thickness of 12mm. Do not over trowel. When the cement obtains its first set, scratch to form a key. the mix is as for the first coat except that clean water only is used for gauging (no additive). This is applied as a further 12mm of render, giving, an overall thickness of the render coat of 25mm. This coat should be applied before the first coat has finally set in order to obtain a satisfactory adhesion between the rendering coats. Scratch surface to form a key for finishing plaster. this should be 3mm of multi-finish or similar. Other finishes are acceptable provided they are porous. 1. Where masonry is unstable, this must be made good prior to the application of renderings. Where it is not possible to obtain a proper bond between the wall fabric and rendering, as in the case of cob walling for example, the rendering must be applied direct to the wall face but over expanded metal lath, previously fixed to the wall surface. 2. Renders and finish coat must be cut short of finished floor level in order to prevent any damp within the solid floor from bring transferred into the soft setting coat. 3. Gypsum plasters, lightweight premix plasters must not be used to bond metal angles to corners. 4. Where conventional timber skirtings are to be fixed they should be coated with wood preservative or ideally pre-treated. It should be remembered that walls will take a considerable time to dry out and it is possible that sufficient moisture would ingress int the new joinery to cause fungal decay. 5. Where practical, fixings onto the walls of all joinery should be by means of adhesives particularly where the areas concerned are below ground level. 6. Our water resistant render work needs to be applied to a minimum of 20mm thick. Occasionally existing wall finishes are under this thickness in which case it may be necessary for the clients to make good above our re-plastering to achieve wall surface continuity. It is essential that the specification is adhered to and not varied unless by previous agreement with ourselves. No other additives must be added to the mix, unless approved by the manufacturer. Lightweight gypsum premix backing or bonding plasters (ie. Carlite) must not be used. Establish a drill course both horizontal and vertical as required to avoid any bypass of moisture from common party walls. The levels of the damp will take into account any conventional damp course and internal floor levels. Injector nozzles will be inserted into the drilled holes and the process of injection using D.P.C chemical damp course fluid injected under pressure reaching a point of refusal by emission of the fluid from the wall. The process of injection is usually complete 8-10 seconds depending on the ability of the particular wall to absorb the fluid. After treatment the nozzles will be removed from the drilled course and all drilled holes sealed effectively with a sand/cement render plug. Wherever possible all treatment will be executed from the external elevations of the property. Where internal treatment is necessary the client must provide unrestricted access to the walls to be treated including the removal of radiators, baths, toilets and kitchen units where appropriate. Rising dampness will be stopped by the installation of a new chemical damp proof course. After the installation of the new damp proof course the walls must be allowed to dry out naturally by the course of evaporation. This is always necessary and the rate of evaporation is dependent on many factors including the level of moisture retained in the wall, the porosity of the wall and its various coverings and decorations and the heating and humidity of the surrounding environment. A wall will never properly dry out even after treatment if there are other sources of moisture ingression. These can take many forms such as cracked or defective brickwork, rendering, sills and plinths. High outside ground levels can result in the damp proof course being "bridged". Wall plaster abutting a solid floor can absorb surface moisture from the floor. Defective rainwater goods can also be the source of water penetration. The product used is based on the insecticide Permethrin, which is one of the new generation of synthetic pyrethroids which are light stable cleared by use under HSS Regulators. Permethrin is active against a range of wood boring insects and marine crustaceans. For remedial and preventive treatments, Permethrin will meet the insecticidal requirements for wood preservatives. This insecticide has been developed for an ever increasing need for safer materials for special situations, ie.. Hospitals, old peoples homes, food stores. 1. Low acute and chronic toxicity to mammals and birds (very hazardous to aquatic life). 2. Pleasant to use. Virtually odourless. Non-tainting. Non-staining. Non-irritant. Avoid contamination of the environment. Lift sufficient floor boards to expose joists, joists ends and wall plates. Where the sub-floor void is of sufficient size treatment may be applied from below without removal of boards. Expose and clean joists, joist ends, and wall plates. Carry out repairs specified in our report (if any). Where new timber is to be reinstated ensure that it is treated with a suitable preservative. Reinstatement of sound old wood should be treated by a minimum of a thorough surface spray but preferably by steeping in the appropriate preservative. Any cut ends of reworked wood should be liberally treated with preservative prior to refixing. Apply preservative. Treat all exposed/infested/vulnerable timbers thoroughly including floorboards. Refix floorboards and any other necessary timbers. Ensure that water tanks are covered. Remove insulation from areas to be treated. If necessary life sufficient boards to expose joists, joist ends and wall plates. Expose and clean down joists, joist ends and wall plates. Treat as above. Remove any lining, if possible from the under surfaces to obtain access to stair risers, or drill holes in risers ready for insertion of backspray nozzle. Treat as above. For treatment of Woodworm contact City Damp Proofing. Click here. There are a number of wet rot fungi which attacks wood when its moisture content reaches 40-50% or higher. The more common wet rots are the Cellar fungus (coniophora puteana) and pore fungus (Fibroporia vaillantii). The most common is the cellar fungus. Open up the affected areas and remove unsound timber from site in accordance with our Timber Replacement Schedule. All remaining sound wood is treated to refusal with fungicidal preservative. All replacement timbers are treated with preservative and where in contact with damp brickwork, are isolated by a damp proof barrier. There is only one dry rot fungus, Serpula lycrymans. It presetns a far more serious problem than wet rot, since it can grow at very much lower moisture contents (as low as 20%) and can penetrate damp masonry. It normally attacks timbers where there is inadequate ventilation and exposed to damp. Once germinated it can spread rapidly and extensively resulting in the total decay of exposed timbers. Open up the area to at least 1 metre beyond the last visible signs of infestation and where masonry adjacent to timber is damp. 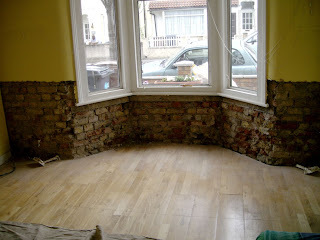 Cut away plaster, remove paneling, skirting and floorboards to expose brickwork and provide access. Remove all timber built in to brickwork such as bond timbers, lintels, plates, pads and grounds. Cut out and remove from site all decayed timber. Spray all timber within 1 metre beyond the visible sign of growth with an organic preservative complying with British Standards. Larger dimension timbers may be treated by an application of bodied Mayonnaise paste to increase penetration. Reinstate wall plaster incorporating masonry anti-funicide in sharp sand and cement render mix 2 coats followed by multi-finish or other suitable plaster finish. Remove fungal strands from the wall surface (and/or oversite where appropriate) by brushing, sterilize with a masonry fungicide. If considered necessary holes will be drilled into the brickwork or masonry and irrigated with masonry anti-fungicide for deeper treatment. We undertake all damp proofing and associated works and offer free quotes and estimates on all work undertaken. All work we undertake is fully insurance backed and we have a team of engineers and surveyors that are fully skilled to tackle any damp proofing problems you might have.